As an ex-pat who was born in Somerset I felt intensely proud! The world becomes a very small place when you're a gardener. This magazine has an incredibly thoughtful and romantic atmosphere, though I sense it is not for the budget-conscious, if the advertisements are anything to go by. Is it possible that the well documented class structure in England has produced a class structure in gardening magazines? And if so, why not? 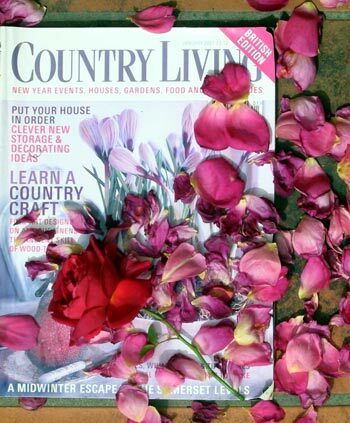 There's no better read on a wet wintry day than Country Living - and the romantic mood of the magazine is wonderful for starting wet winter daydreams. It's nice to forget the realities of gardening at such times. So there's a lot of fun and no harm done when a colonial gardener gets their hands on English Country Living! Especially as the Moosey garden once got a mention. Thanks, English Country Living, you're an evocative read.